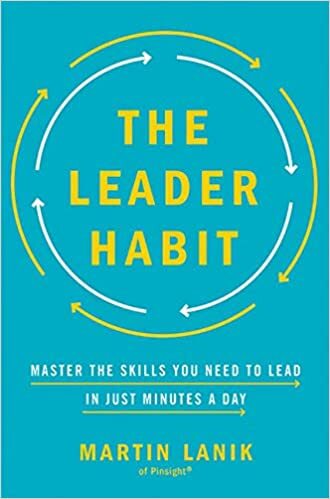 As I read Martin Lanik’s book, The Leader Habit: Master the Skills You Need to Lead – In Just Minutes A Day, I thought of Joe. Joe was like many of the effective leaders I’ve seen. The teams he led were productive and had high morale. It wasn’t because Joe was a “great motivator.” He wasn’t a brilliant thinker. He didn’t know some secret known only to great leaders. Joe and other great leaders I’ve seen in action got results because they repeated basic, effective behaviors over and over and over. That’s the first big insight that underlies this book. If you want to be an effective leader, you need to master basic leadership habits. How will you learn those habits? If your experience is typical, you’ll attend a training session that’s at least one day long. That session will cover a lot of material with stress on knowledge rather than practice. You’ll head back to work where you try to remember the most important parts and put them into action. Most leadership training today happens in large, widely-spaced chunks. Not the best way to learn to be an effective leader. Those two insights are the core message of Martin Lanik’s book. You need to master critical leadership habits one at a time, practicing each one until you get it right. His book promises to help you do that, in just five minutes a day. That’s where the trouble starts. The book is not up to the quality of the ideas. The book begins with a simple example that gets your hopes up about the entire book. Then it wanders off into a long discussion of the theory behind Lanik’s methods. I noticed that one Amazon reviewer said that was where the value is in the book. I disagree. Lanik could put most of that material about how he developed the model in an appendix. The value of the book is in the how-to parts. That’s another problem. Lanik and his team have identified 22 leadership skills. That’s a lot. But there’s more. To “master” those skills, you need to master 79 micro-behaviors, developing each as a habit. According to Lanik’s research, it will take you 66 days to master each micro-behavior. If you do the math, that comes out to 14 years. To be fair, Lanik tells you how to develop the best keystone habits to give you the biggest bang for your buck as soon as possible. You must choose what micro-behaviors to work on first by analyzing your strengths and weaknesses and personality. None of that is easy. Let’s leave aside the part about setting goals for others and whether that’s a good idea. If you’ve ever tried to set goals for yourself that are both bold and doable, you know that’s difficult. The exercises don’t help you much. And they don’t even address setting goals for others and how you might go about that. There’s helpful stuff here, but it will be hard to get value from it. It will take a lot of work. It will be a complicated project. And you must do a lot on your own. That’s not a recipe for success. Get value from this book by remembering the key points. Effective leaders develop effective leadership habits. Work on one small thing at a time. Keep getting better, a little bit every day. That’s a good way to develop leadership skills. If you want to get more than that from the book do it with an accountability partner or a coach. They will help you work through the analysis. You’ll get precious feedback from another person. And you will be more likely to stay with it because you’re committed to that person. The Leader Habit gives you a way to develop effective leadership habits and become a better leader. Unfortunately, the author’s system is complicated. It will take a lot of work to understand, do the analysis, and put it all into practice. The book is not as helpful for that as having another person work with you to master the material.